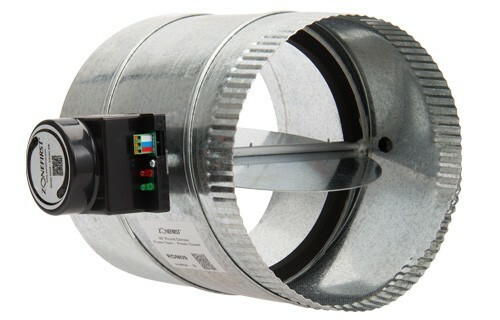 We install zone damper systems. We can install up to 4 zone damper systems through one ac-unit in your house. You can control 4 different areas in your home at the same time through one ac-unit with 4 zone damper systems. A damper is a valve or plate that stops or regulates the flow of air inside a duct, chimney, VAV box, air handler, or other air handling equipment. A damper may be used to cut off central air conditioning (heating or cooling) to an unused room or to regulate it for room-by-room temperature and climate control. Its operation can be manual or automatic. New US residential building codes require permanent access to dampers through ceiling access panels. Zone dampers are not 100% reliable. The motor-to-open/motor-to-closed style of electrically operated zone dampers aren’t “fail-safe” (that is, they do not fail to the open condition). However, zone dampers that are of the “Normally Open” type are fail-safe, in that they will fail to the open condition. No inherent redundancy for the furnace. A system with zone dampers is dependent upon a single furnace. If it fails, the system becomes completely inoperable.